Join Yukon Jack for a seriously silly day with your child! Children and dads alike will learn about storytelling, cool technology, amazing superheroes, Jedi training and other fun stuff. Act like nobody is watching, sing like nobody is listening and simply enjoy getting seriously silly with your child! Floor Hockey Classic at Rogers Place! So you're a Canadian who loves hockey, eh? Join us and 100.3 The Bear's Yukon Jack for our first ever Floor Hockey Classic! We'll begin our hockey-themed activities at 11 a.m. with an interactive sports-themed storytime and will have a variety of hockey-themed crafts and activities until noon. PLUS there will be prizes and a very special surprise guest. Stay tuned for upcoming Daddy Boot Camp classes! Recommended children's age for Daddy Boot Camp is 5 to 9 years old. This is a FREE, drop-in event; everyone is welcome! “If I had doubted how effective this program was, I was reminded plenty of times over the spring when my son kept asking me about Daddy Boot Camp. My goal was to create memories between kids and dads and in the process we made many of our own.” - Yukon Jack. 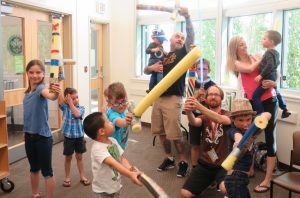 NOTE: For children under 5 years old, EPL offers early literacy classes such as Sing Sign Laugh and Learn, Puppet Show, Family Storytime and Baby Laptime. Learn more.